CPUScalerUltimate 2.1.2 – for use with the regular Palm Pre kernel and/or kernels capable of 125-800mhz. 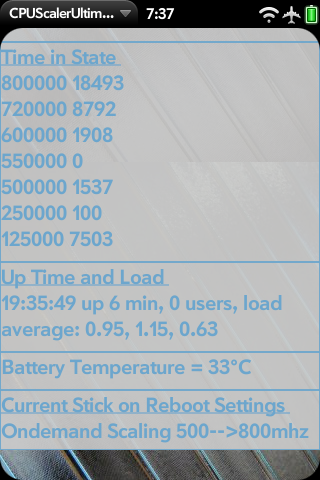 It also displays cpu info, up time, load averages, battery temperature, and current stick settings. It can make your current cpu settings “stick” on reboot. ***If you enjoy this product, think about making a donation. ###This product will not work completely without a compatible kernel installed (see near bottom of page for list of compatible kernels). Please read this entire post before installing!!! Running your phone at very high or very low frequencies may cause problems with your phone. You have been warned. I am not responsible for anything that happens to your phone or anything your phone is/was affecting. Use at your own risk. To install the new version you must uninstall the old CPUScaler app and its service with WOSQI or Preware!! Then you can download and install the new CPUScaler app and its service with WOSQI or Preware. 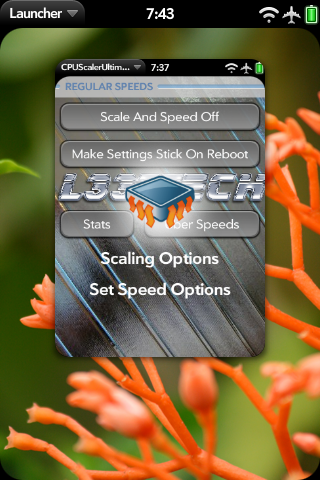 This app was developed to give a Palm Pre user the ability to turn cpu scaling on and off with the touch of a button, and changes are made on the fly. 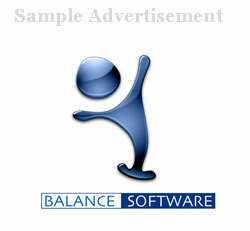 The latest version also allows the user to set the cpu to a constant speed of their choosing. 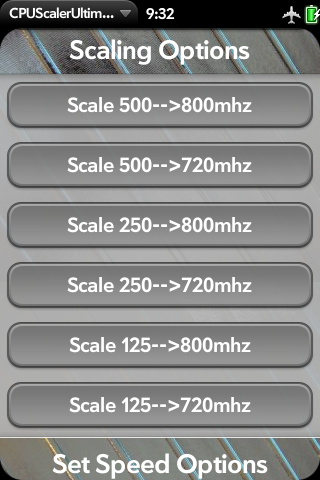 There are also other scaling options now if you don’t want to use the standard 500–>600mhz. This app is only for the Palm PRE! This does not work on the palm PIXIE! To install you have to you WOSQI (webos quick install) or Preware. To completely uninstall you have to use WOSQI or Preware! It is very important that you remove all cpu effecting patches or code before you install any version of CPUScaler. This includes any scaling, luna setting, userspace, or smart reflex patches or scripts. Some other patches have demonstrated conflicts. 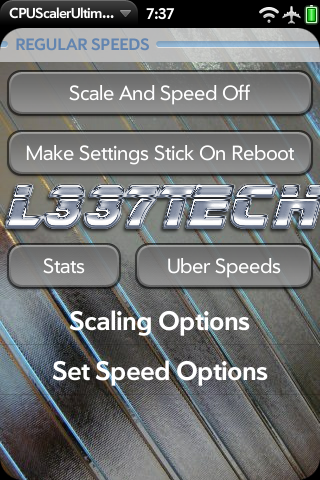 into Preware and call it “L337Tech.com-webos-free”. CPUScalerUltimate 2.1.2 – for use with the regular Palm Pre kernel and/or kernels capable of 125-800mhz. It also displays cpu info, up time, and load averages. ***If you enjoy this product, think about making a donation. ###This product will not work completely without a compatible kernel installed (see bottom of post for list of compatible kernels). Now you need to make sure you have the latest version of WOSQI and WebOS Doctor in the same folder together. Open WOSQI and add the two ipk files you just downloaded to the install queue. Now hit install and accept the statement about l337tech requesting access to run a script. The script is just a post install script to move the cpu scaler service to the correct folder. Now you should have everything you need installed and ready to go. Alternatively you can now use Preware. The free “Lite Versions” are available by a custom feed mentioned above and the CPUScalerUltimate version is available on a private custom feed supplied on purchase. Once the custom Preware feed has been added, installation is as easy as clicking on the packaged you want installed. Preware will also alert you if you need to update any versions of CPUScaler that you have on your Pre. Simply hit the update button to upgrade to the latest version. To use the app simply open it up and select an option by pressing won of the buttons. You will know if the button worked if you a notification at the bottom of the screen pop up. If you have CPUScalerUltimate, navigate to the stats page and verify that the settings you selected were applied. If you have any other version of CPUScaler you can use the “Set Speed 250mhz” or “Set Speed 125mhz” and see if scrolling around is uber slow. Now you can go ahead and close the app and your cpu will be scaling (or not scaling) until you reboot or shutdown your phone. If you ever reboot your phone will go back to default processor settings so you will need to open the app back up and hit scale on again. If you have the CPUScalerUltimate version and hit the “Make Settings Stick On Reboot” button then the settings that you “stuck” will be applied at reboot. 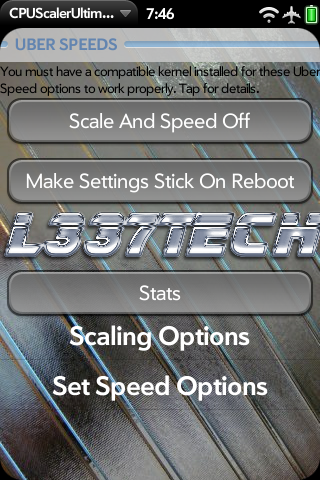 To turn stick settings off just hit the “Scale And Speed Off” button. If you choose to a “Set Speed” option the speed will remain constant until you reboot or enter/exit a application developed with the SDK (typically 3D games). 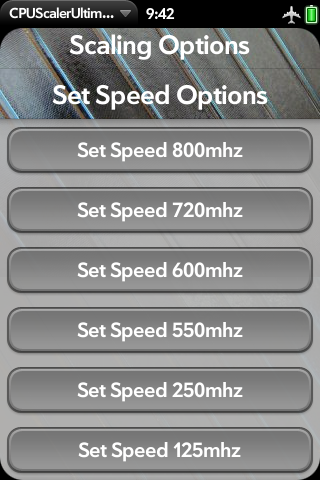 You will want to re enable the desired “Set Speed” option once you exit the SDK app. To uninstall the app and its service completely you have to use WOSQI or Preware. Simply go to device management in WOSQI and select CPUScaler and an service called “Service to scale the cpu”. Now that the two apps are selected hit uninstall. CPUScaler and its service should be completely removed from your device now. For Preware, navigate to installed packages and look for CPUScaler and its service. Click them and hit remove. New features and abilities have been added. 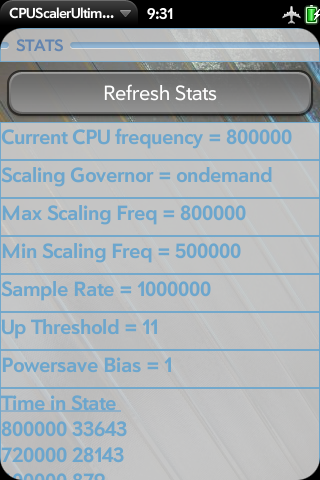 Currently it still has the recommended setting for cpu scaling that is disused in detail in this thread. 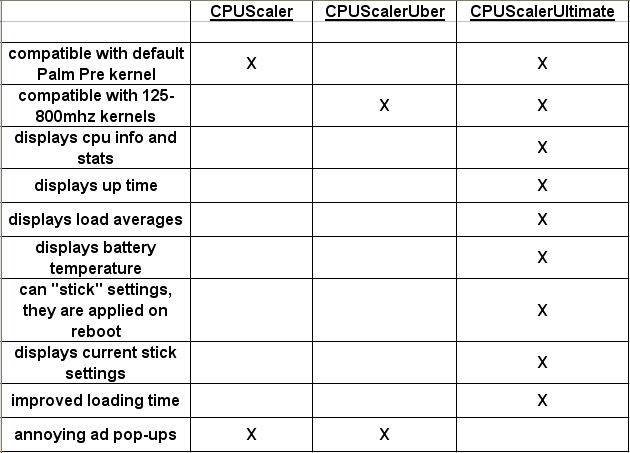 But basically it changes some parameters in the kernel to get it to scale from 500-600mhz depending on the load. See the end of the article for the exact commands used for the “scale 500–>600mhz” setting. The set speed options simply uses the userspace scaling governor to set the cpu at a speed and keep it there till you tell it otherwise or enter/exit an SDK developed application (Palm uses the userspace scaling governor default). I, Casey Broome, or L337tech.com are not responsible for any damage this app could or may cause to your phone or anything your phone is or may effect. This app should only be used by people that understand the risk of running the cpu beyond its default settings. It is true that Palm sets the cpu to 600mhz during PDK gameplay (usually 3D games), but Palm also sets the processor back to 500mhz when you quit the game. To upgrade you CPUScaling app to the latest version you must uninstall the old app and service first! Then you can download and install the latest version. I just want to reiterate that if anything goes wrong once you hit one of the scaling or set speed option buttons simply restart, shutdown, or pull the battery. You phone will go back to default settings. The TI cortexA8 processor in your phones is rated to run at 600mhz but an early batch of processors were “bad” and degraded rapidly when set to 600mhz or higher. This caused Palm to down clock all the Pre’s even though many people have a “good” processor that are more than capable of long term 600mhz use. This can be seen with the people that have tried scaling before. Some people’s phone love it and never have one problem. 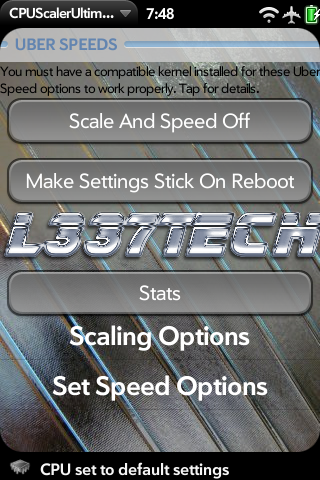 Other people have problems such as random reboots and hangs when using a scaling patch. I would like to give my thanks to DrewPre for the great help creating and compiling the java service, and rwitby from WebOS Internals for help packaging up the java service. I would also like to thank unixpsycho and caj2008 from precentral forums for creating an amazing kernel that allows the pre to run at speeds between 125-800mhz. CPUScalerUber would not be possible with out it. I have donated to DrewPre and rwitby for their help. Good luck everyone and happy scaling! 2. Custom 125–800mhz kernel customized by Unixpsycho and Caj2008, see this thread. Caj2008 has performed extensive alpha testing on this kernel. 1. Custom 125–800mhz kernel customized by Unixpsycho and Caj2008, see this thread. Caj2008 has performed extensive alpha testing on this kernel. 2. Custom 125–800mhz kernel customized by Unixpsycho and Caj2008, download from this thread. Caj2008 has performed extensive alpha testing on this kernel. A kernel built by unixpsycho/caj2008 and packaged by L337tech into an easy install ipk for WebOS 1.4.0 and 1.4.1 is supplied via download page with purchase of CPUScalerUltimate (look for it in the install instructions)..
By clicking on the “buy now” paypal link you have agreed to these terms of purchase. When purchasing an item on this page, you are buying the product it refers to “as is”. The product that a “buy now” paypal link is referring to is typically found directly above. You are not buying future versions of the product. The product is not guaranteed to be updated. The product is not guaranteed to work with future versions of WebOS or future versions of the Palm Pre. This product might never be updated. You can download any product found on the download page including future versions of the product if you bought a previous version of the product. You agree to keep the download link and download page confidential. Sharing this information or downloading without purchase can lead to legal action. This product will not work completely without a compatible kernel installed. You are not buying or may never recieve support for this product. Installation and proper functionality is not guaranteed. This product may not work with your Palm Pre in its current configuration. This product changes all the time. I, Casey Broome, or L337tech.com are not responsible for any damage this app could or may cause to your phone or anything your phone is or may effect. This app should only be used by people that understand the risk of running the cpu beyond or below its default settings. Information about this product found on this page or other pages managed by myself may not depict the product exactly in its current state. I always wanted to utilize my Palm Pre’s bluetooth capabilities but my car was too old. I had to install a Motorola T605 bluetooth adapter kit to my car since it doesn’t have bluetooth. Now its supports both phone calls and music. The phone calls come through a small but very powerful speaker that came with the bluetooth kit. I used industrial strength Velcro for the touchstone install. There is a small Motorola control unit installed under the radio that controls all the bluetooth functions like accepting phone calls and playing music or switching songs. My factory stereo does not have aux input but it does have a dvd player on the roof that has aux input so i just ran wires from there through the roof down the wall of the car to the bluetooth adapter. The kit also includes a really nice microphone that i installed near the dome lights. The Motorola T605 kit only cost 49$ and came with everything necessary to make a sweet bluetooth stereo unit. It can be purchased below. I used it a lot now and absolutely love it. The bluetooth is easy and seamless. Now I love my pre even more. I should have a quick video completed shortly but if you would like to see a few pictures click here. I have to admit that the touchstone charger was one of the top 5 reasons why I switched to the Palm Pre from the iPhone 3G. The touchstone charger has truly revolutionized the way we charge our phones. Before it was all about finding the end of your charging cable then manipulating it in such that it weasels its way into an overly complicated connector on your phone. Now it is so easy to charge, simply place your phone on the touchstone. I wanted to do a quick review of the touchstone. There are some tips and tricks and some features that you may not know about. This article is a good place to learn everything about the charger. The touchstone charger kit comes with a touchstone and a back cover that is compatible with the touchstone. That is all that comes in the kit. There is no micro-usb cable and no ac adapter that is compatible with the touchstone. The idea was that the ac adapter and micro-usb cord that came with your Pre will be used with the touchstone. Well this was a bad idea because almost everybody will be purchasing more than one touchstone (home and work) which leaves you needing an additional micro-usb cable and compatible ac adapter. And to make thing worse you cannot use any ac adapter or micro-usb cable with the touchstone. It is only compatible with ac chargers that put out 1000mA and has a certain pin configuration, and micro-usb cables that have extremely small and streamlined ends so that it can fit into the tiny hole in the back of the touchstone. Therefore, you will need another Palm ac adapter and micro-usb cable. However, i was able to find a way to obtain the Palm ac adapter and micro-usb cable for free. Skip to the last paragraph if you would like to know how. There are some ac adapters on the web that have been found to work but they are very hard to find, and you could buy any micro-usb cable and file down the end of it with a dremel or something. Now that we are done with the logistics, lets talk about the touchstones features. It has a very sticky bottom that literally sticks (and sticks hard I might add) to flat surfaces. To remove the touchstone you need to twist and lift up. It can be reused as many times as you need it on different surfaces but if the bottom starts to collect too much dust it can loose its stickiness. If that happens then you need to wash the bottom wish soapy water and let it dry. You will be restored to full stickiness. The reason that the touchstone has a sticky bottom is because the magnets holding down your Pre to the touchstone are very strong. In fact many people use the touchstone in their cars with no problem at all. The Pre stays put even while making sharp turns. The touchstone back cover that comes in the touchstone kit is a new back for your Pre. It has magnets and induction coils built into it. It is a nice rubbery/plastic feel like that is like a matte finish unlike the standard Pre back that is a slick and polished finish. I like the touchstone back much better than the standard back. It is easier to grip and there are no finger prints. Now that you have your touchstone stuck to your table and the touchstone back installed on your pre, what happens? Well when you set you pre on the touchstone you get the “ba-bing” sound and it says charging. Then the Pre turns into basically a night clock. The Pre is dimly lit and has the time and notifications on it. It can be displayed vertically or landscape depending on how you set the Pre on the touchstone. A lot of people are annoyed by this feature because when you are trying to sleep it can be slightly distracting. I have had no problems with it and i sleep right next to my Palm. Still, Palm should offer the ability to turn this feature off. When your Pre is on the touchstone wifi stays on and the Pre wont go to sleep if you have it on (if you manually make it sleep it reverts to the “night clock” mode. It is extremely easy to place the Pre properly on the touchstone. It is also a very fast process placing and removing the Pre. If you receive a phone call while on the touchstone be careful because if you pick it up off the touchstone you just answered that phone call. It is supposed to emulate a standard phone where if you pick it up off the hook you answer the phone. The touchstone charges very fast. It is almost as fast as simply using the standard ac adapter. The touchstone also enters a low power state when the Pre becomes fully charged. The touchstone is incredible and I have one at home and at work. It has made charging the phone almost fun. I prefer to use the touchstone instead of leaving the Pre in my holster because it sits on my desk where I can see notification when they pop up. I highly recommend the touchstone but make sure you know what you need before you place and order. First you will need the touchstone charger kit which can be purchased below. Then if you want a second you will need to purchase a touchstone by itself which can also be purchased below. Finlay you will need to obtain another Palm ac adapter and micro-usb cord. This can be achieved by using the purchase link below or using the FREE method at the bottom of the page. The touchstone definitely gets the L337Tech stamp of approval. This has worked several times for me (Me and my women have lots of touchstones). First go to google maps and input your area code. Once the map zooms in on your area type “sprint wireless”. Look for a result that says “Sprint Store”. This is a corporate sprint store. The other results will just say “Sprint” or “Sprint PCS” etc. Those are little stores that do not have what we need. Second, drive your vehicle to the store and talk to a representative. Say, “I have two touchstones but I only have one Palm ac adapter and one Palm micro-usb cable that came with my Pre. Can I get another Palm ac adapter and micro-usb cable since that is the only thing that will work with the touchstone.” The rep will then try and sell you the aftermarket crap in the store. Reply with, “those do not work with the touchstone, the touchstone website specifically says it has to use the Palm ac adapter and micro-usb cable.” He will then say well we do not sell those in the store. Reply with, “well can I get on from the back that y’all use for testing and stuff.” He will then go to the back grab the goods then give it to you for free. Sprint is trying really hard to keep everybody happy with the Pre and they are aware that the touchstone does not come with the proper ac adapter and micro-usb cable. They will give you the stuff for free and smile the entire time. Like I said I did this several times for all my touchstones. Have fun with your new charger. After several weeks of testing I am ready to name the king of the Palm Pre belt clip holster’s. First of all let me explain that I work in a building that requires business casual dress. So simply carrying the Pre in my pocket was not acceptable (huge bulge). Therefore, I began my quest to find the perfect belt clip holster. At first, I opened the packaging and took out the holster and the first thought popping into my head was high quality. It felt very solid and was made from a material that seemed to be a plastic/rubber hybrid. The swivel was solid and doesn’t moved unless you force it to move with strong hand twists. The spring clip had a medium strength “grabbiness”. Under the spring clip was a small protruding clip about 1cm long which I guess is there to help guide the Pre into place. The holster had a nice felt layer on the inside which is supposed to protect your screen from scratches. However, 90% of the Palm Pre users will have a scratch resistance shield on their screen so the felt layer may not matter much. I found that the Pre would only go into the holster if the screen was facing inwards. I also found that the Pre does not seat perfectly in this holster. The Pre wants to slide open when inserting into the holster and even when you push down on the spring clip it never goes perfectly closed. I found a fix for this. I simply cut off the 1cm long protruding piece of plastic on the top underneath the spring clip. I am not sure why this was deemed necessary for the holster by Seido. I found it a huge nuisance. After removing the 1cm long protruding piece of plastic with wire cutters I was able to get the Pre into the holster flush. It was also easier to remove the Pre from the holster with that piece gone. This holster was dead simple and dead cheap. When I got it, it did feel a little cheap but I was happy enough considering the price. It has no clip mechanism. It relies on the elasticity of the plastic clip on the top to hold the Pre in place. It also allows the Pre to be facing outward in the holster. The holster mad for easy easy Pre entry. Removal was more difficult than the Seido holster. In most cases you will need two hands, but after a while in certain situations I could remove it with one hand. The real plus for this case is that you can put it in inwards or outwards. There are situations where you want to see notifications without removing the Pre from the holster. Simply put it in the holster facing outwards for those situations. I found this a HUGE plus for the holster. The other huge bonus for this holster was that it was much slimmer and sleeker than the Seido. The clip on the top part of the Seido protrudes too far and your arm can hit it at time. But this Optimum case is perfectly flush with the face of your Pre so my arm never hit it once. I love this holster. I have been using it for several weeks now and I feel totally comfortable claiming it the best Palm Pre holster in the world (currently). This holster definitely gets the L337Tech stamp of approval.